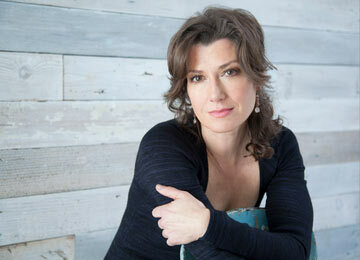 Jesusfreakhideout.com Music News, June 2013: Six-Time GRAMMY® Winner Amy Grant to Make National TV Blitz with Appearances on ABC's "The View," Fox News' "Fox and Friends" and ABC's "The Chew"
"Fox and Friends" and ABC's "The Chew"
Nashville, Tenn. (June 19, 2013) - On June 20, six-time GRAMMY® award winner Amy Grant will appear on ABC's "The View" to perform her next single "If I Could See." The appearance kicks off the beginning of a national television media blitz for Grant in support of her best-selling and first studio record in a decade, How Mercy Looks From Here. Grant is also set to tape an interview and performance with WNYC radio's popular Soundcheck show, which will stream live here on the 21st at 2pm ET and is scheduled to air on the station June 25. Additionally, she will take to the outdoor plaza stage, performing on "Fox and Friends" June 22 and appear on ABC's popular lifestyle show "The Chew" on July 19. Grant's television appearances come on the heels of her extensive press and radio tour which included media spotlights on: CBS This Morning, NPR's Weekend Edition, People.com, Morning Joe on MSNBC, WOR Radio with Rita Cosby, FUSE NEWS and more. How Mercy Looks From Here debuted at No. 1 on the Christian Soundscan and No. 12 on the Billboard 200 chart. The album has been declared by critics as a "vibrant," "glowing production" and one of the "best albums of the year." About Amy Grant: Amy Grant's career spans over 25 years and stretches from her roots in gospel into her experience as an iconic pop star, songwriter, television personality and philanthropist. Grant has sold more than 30 million albums boasting one five-time Platinum album, one triple Platinum and one double Platinum album, as well as six platinum and four Gold albums. Amy has won six GRAMMY® Awards in multiple categories, beginning with the platinum selling Age to Age in 1982 and 25 GMA Dove Awards. She also has six No. 1 hits - including "Baby, Baby" and "Every Heartbeat" - and is one of only two Christian artists to be awarded a star on the legendary Walk of Fame in Hollywood. In 2003, she was inducted into the Gospel Music Hall of Fame. In 2006 Amy announced her first ever label shift to EMI Music Group where her entire music catalog was re-mastered and released via a GREATEST HITS album and made available for the first time digitally. Amy released her first studio album in 10 years, How Mercy Looks from Here in May 2013.